The legacy of the United Farm Workers is invoked more than any other in labor history (with the possible exception of the UAW's Flint Sit-down Strike), while the Teamsters are virtually synonymous in the public mind with power and corruption. I started this project with the aim of learning the story of their intersection. Last edited by wes on June 1st, 2010, 2:03 pm, edited 21 times in total. Last edited by herb on January 6th, 2010, 9:41 pm, edited 1 time in total. The struggle of the United Farm Workers (UFW), and their dynamic leader Cesar Chavez, to unionize field laborers- the lowest rung in California's profitable agricultural industry- was deeply marked by a decade of conflict with the International Brotherhood of Teamsters (IBT). After the initial successes of the UFW's predecessor unions, the IBT- which had long represented workers handling agricultural products after harvesting, in hauling, packing, and canning/processing- made a series of agreements with agri-business growers to break or prevent strikes and boycotts, and bring farmworkers under Teamster contract. The UFW Organizing Committee was formed in 1967 to meet the Teamster challenge, and in three distinct engagements- the last of which extended for 4 years- the United Farm Workers defeated the Teamsters by using worker support to mobilize a variety of different constituencies. Following each victory, the UFW forced the Teamsters to withdraw from fieldworker contracts and sign pacts re-affirming the jurisdictional division of the industry. 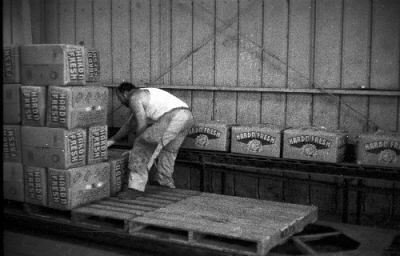 Complicating the rivalry, field hands were specially excluded from the National Labor Relations Act (NLRA)- although the NLRA did cover the packing shed, truck, and processing workers traditionally represented by the Teamsters. This meant that field hands (usually just called “farmworkers”) were without normal legal means to choose which union would represent them. The resolution of the UFW-Teamster conflict would ultimately hinge on the 1975 passage of a new law in California– the Agricultural Labor Relations Act (ALRA)- which established norms for union elections to determine representation. Last edited by wes on December 11th, 2012, 6:20 pm, edited 3 times in total. 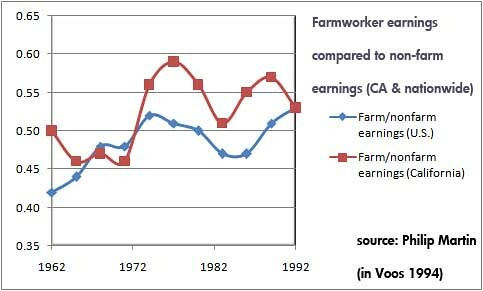 California agricultural employers wielded tremendous economic and political clout, which they used to secure many special considerations from lawmakers at the national, state, and county levels. For their employees, the exceptional advantages for agri-business translated into a profound civil and political disenfranchisement. Phillip Martin wrote: [T]he neglect of farmworkers was rooted in more than the assumption that most would soon become farmers or nonfarm workers. A permanent class of farmworkers, especially in a country that offered free land to all who wanted to farm, was an uncomfortable topic in a nation founded on the ideals of equality. Slavery was the system initially used in the South to assure plantation agriculture…a supply of labor. Farmers in the western United States depended on hired farmworkers, many of whom were immigrants who had no other U.S. job options, to help them produce crops for distant markets in the eastern states. Not only were farmworkers excluded from the NLRA- therefore having no legal protections to organize a union- they were also excluded from the Fair Labor Standards Act (FLSA)- which meant that for farmworkers there was no minimum wage, no unemployment benefit, no Social Security, no overtime pay, and no prohibition against child labor. The rural, seasonal, and migratory nature of harvesting work greatly compounded the difficulties faced by farmworkers. 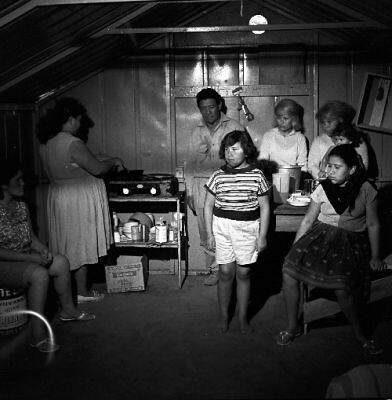 Most farmworkers lived in labor camps, or communities with only rudimentary housing and little or no civil infrastructure. Having grown up the son of a farmworker, Chesar Chavez got his start organizing in these communities. Each crop had particular characteristics, some, like grapes, required more skill; others, like lettuce harvesting, required a coordinated team. The worst jobs entailed difficult “stoop” labor- which proved crippling to many workers over the long term. Frequent exposure to pesticides was another contributing factor to farmworker suffering. 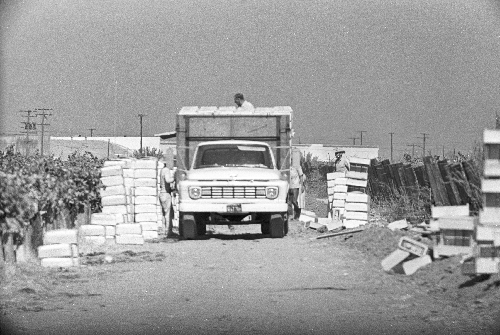 At the beginning of the Teamster/UFW conflict, there were approximately 250,000 hired farmworkers in California. Last edited by wes on December 11th, 2012, 6:27 pm, edited 4 times in total. 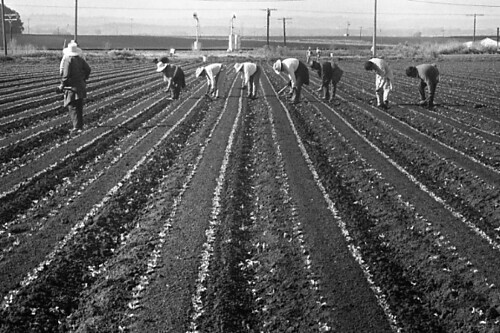 Given the hardships of life as a farmworker, growers found that- without improving the jobs or wages of farmworkers- it was necessary to regularly supplement the supply of labor. 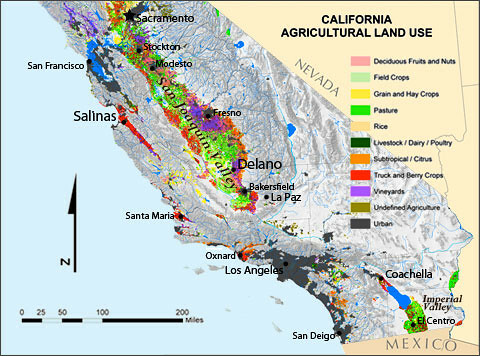 The importation of immigrants for use as field hands has been a nearly uninterrupted practice in California agriculture since its inception. Since the outbreak of the Mexican Revolution in 1910, the majority of new farmworkers had been of Mexican descent. While initially a result of a “natural” exodus, the use of Mexicans as field labor was formalized during World War II through a diplomatic agreement between the U.S. and Mexican governments. These “braceros”- named after the Spanish for “arm”- proved such a valuable resource for growers that they lobbied for the program’s extension after the war. 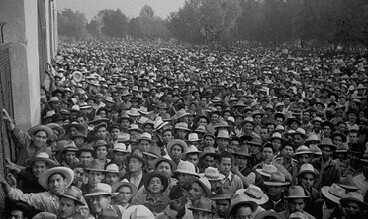 The program would continue for over 20 years, during which time braceros were used by growers to ensure a constant labor surplus, and ruthlessly deployed as wage-cutters, strike-breakers and replacement workers. 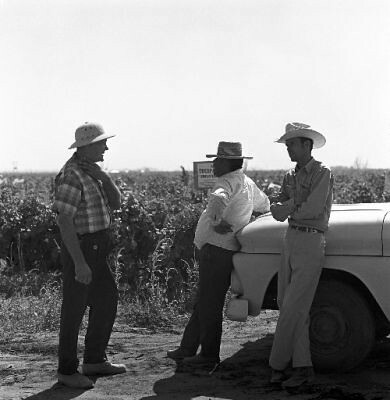 Over a decade of agitation by labor and religious leaders, the rising civil rights consciousness of the early 60s, and the increasing mechanization of the cotton harvest (which had employed 60% of braceros), finally brought a first decisive step forward for agricultural laborers: the termination of the bracero program. Last edited by wes on December 11th, 2012, 6:30 pm, edited 2 times in total. 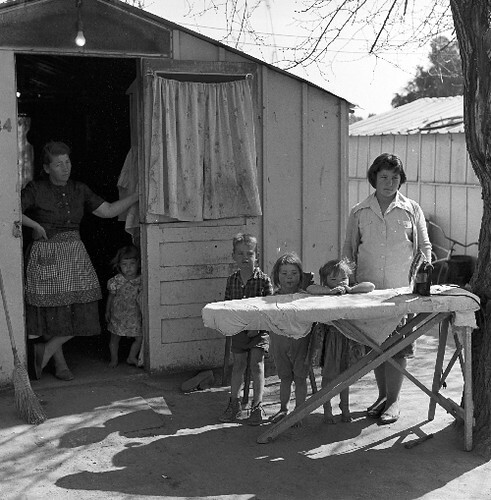 The union struggles of farmworkers in the 1930s had been put down with force. Unions had only been able to hold on in the better shed-and-truck jobs- as well as the cannery jobs- which were covered by the NLRA, and had been organized by the Teamsters. Since that time, the IBT had grown to become the nations’ largest union, with nearly 2 million members. The Teamster, wherever possible, preferred to get contracts by “organizing employers”- particularly by threatening to cut off their deliveries- rather than organizing workers. The IBT had been expelled from AFL-CIO in 1959 amid charges of corruption. Walsh Craypo (1979) wrote: The Teamsters’ initial involvement with farm worker contracts was precipitated by a large grower’s problems with unionization threats from other unions. Bud Antle, Inc., one of the Salinas Valley’s wealthiest growers, signed a field worker contract with the IBT to thwart the organizing efforts of two more radical unions- the Agricultural Workers Organizing Committee (AWOC) and the United Packinghouse Workers of America (UPWA). The cannery locals, in particular, preferred fieldworker contracts which maintained “prosperity in agriculture,” i.e. the wealth of the growers- and assured them relatively easy negotiations for their 70,000 members in agriculture-related jobs. 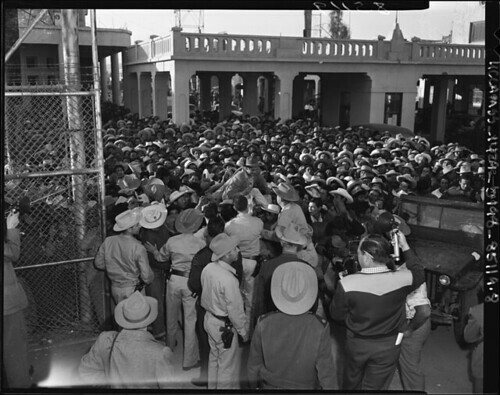 Teamsters involved with the Antle contract were the only labor leaders who spoke out for an extension of the bracero program- the contract covered about 800 braceros, who paid dues although they had no rights within the union. Last edited by wes on December 11th, 2012, 6:33 pm, edited 2 times in total. The two unions that would join together. The Agricultural Workers Organizing Committee (AWOC) was an AFL-CIO effort which had been largely de-funded since 1961. It had a small membership- less than 10,000. A largely self-organized group of 800-900 migrant Filipino grape workers also claimed AWOC membership. The other was Chavez's National Farm Workers Association (NFWA), an even smaller, independent union, with about 200 active members, composed mainly of Chicanos and Mexican immigrants. 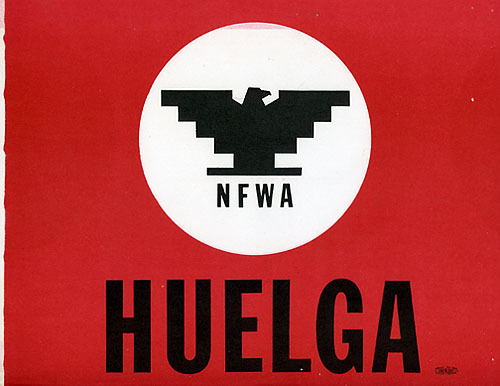 The NFWA had begun in 1962 as anything but a radical union; it focused, instead, on mutual aid. The few strikes it had been involved in had not ended well, and Chavez knew his organization did not have the resources to conduct an effective strike on its own. At the time of the grape strike, the AWOC had an ongoing project with the Teamsters in Ventura County. Last edited by wes on December 11th, 2012, 6:37 pm, edited 1 time in total. Farm Labor Contractors (FLCs) acted as middlemen between growers and farmworkers, collecting a fixed fee from the one and negotiating a wage- and/or piece-rate with the other, assembling work crews from the pre-dawn “shape-ups” held in skid rows and border towns. Unscrupulous contractors were notorious for inventing ways of taking back their crews’ hard-earned pay, charging for everything from transportation to tools to drinks of water. In part, the weakness of the AWOC program was that it relied on farm labor contractors to sign up new workers for the union. The AWOC held over 100 contracts with FLCs, nominally covering their workers, but this hardly translated into union strength. On the one hand, FLCs were content with the status quo; on the other, since workers were not consulted by the union (except through the contractor), most workers regarded the dues deducted from their pay as just another contractor trick. Many contractors were Anglos, as were the union organizers the AWOC had on staff- there was a cultural gap in the program. Some of the earliest campaigns waged by Chavez’s National Farm Workers Association were against bad contractors who cheated their crews. It was the conviction of Chavez and the other leaders of the NFWA that the fight against contractors was a key point of struggle for the fledgling union- without checking the power of the contractors, the lion's share of any union gains could easily be siphoned off by the middlemen. Last edited by wes on December 11th, 2012, 6:38 pm, edited 1 time in total. In September of 1965, Filipino AWOC grape-pickers went on strike to protest their wages in the grape vineyards of Delano. They called on the NFWA to honor their picket line. The NFWA was already focused on grape-picking as a good place to start building union strength. Harvesting grapes required more skill than most jobs, and had enough year-round work to support a relatively larger number of settled families. 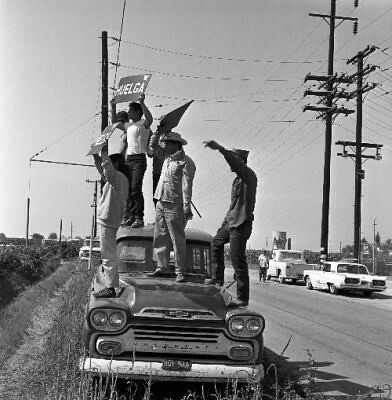 At the beginning of the Delano Grape Strike, the Filipinos of the AWOC were focused on immediate wage demands, and were hesitant to take on the largest growers, but the inclusion of Chavez and the NFWA broadened the scope of the struggle. The NFWA added a new demands to the strike: union recognition and the end of the labor-contractor system and its replacement with union hiring halls. Last edited by wes on December 11th, 2012, 6:39 pm, edited 1 time in total. As the two unions struggled to keep pressure on growers even after the growing season ended, they hit on the boycott as a weapon. Ironically, the exclusion of farmworkers from the NLRA was now to their benefit- the NFWA was not subject to the Taft-Hartley amendments that restricted in their right to boycott. The NFWA and AWOC used this legal freedom to its full advantage, choosing a liquor company with a relatively recent acquisition in grapes, and organizing a boycott of not only the products, but also of stores which sold them (a secondary boycott, illegal under Taft-Hartley). Last edited by wes on December 11th, 2012, 6:42 pm, edited 1 time in total.